You’ve heard the saying a million times – ‘The kitchen is the heart of the home’ – and it couldn’t ring more true in modern homes where kitchens are central in open-plan living. The difference between an ordinary and extraordinary kitchen often comes down to planning. While of course budget can play a part, we’ve seen people with excessive budgets fumble due to poor planning and on the flipside, others who have created a truly stylish and functional kitchen on a budget. It really comes down to planning and understanding a few design principles. Today we’re sharing our top 10 tips for successful kitchen planning so no matter what budget you’re working towards, you can achieve a kitchen that ticks all the boxes. Whether you’re renovating or building new, the first step is to consider the space you have to work with and play with different layouts or configurations. When renovating older homes, it often helps to think outside the box and consider opening up the space – potentially removing walls or expanding the size of the kitchen. Sometimes in poky kitchens, it’s also a great idea to increase the size of the window or even create a gas strut window with a serving bar to the outside. In newer homes, an architect or builder will generally propose the kitchen design. That doesn’t mean you can’t go through it with a fine toothcomb and consider making a few alterations to better suit your family needs. For example, Gina increased the depth of her kitchen island bench to make it more functional for meal preparation and entertaining. Once you know the space you have to work with, it’s time to nut out how exactly you will use the space and design the layout and fixtures to suit. You may have come across the term ‘triangle layout’ which is an ergonomic design rule where the kitchen sink, fridge and cooking area need to be linked (preferably in a triangle). It avoids wasted steps and makes the overall design more functional. Also when deciding your layout, consider where you want to position your appliances and desired sizes. For example, would you prefer to have an oven under your cooktop or possibly two ovens stacked in a wall tower? Would you prefer a concealed rangehood or one that makes a statement in your design? There are even more considerations when it comes to appliances, as well as other functional things such as lighting and storage that we discuss in detail below. 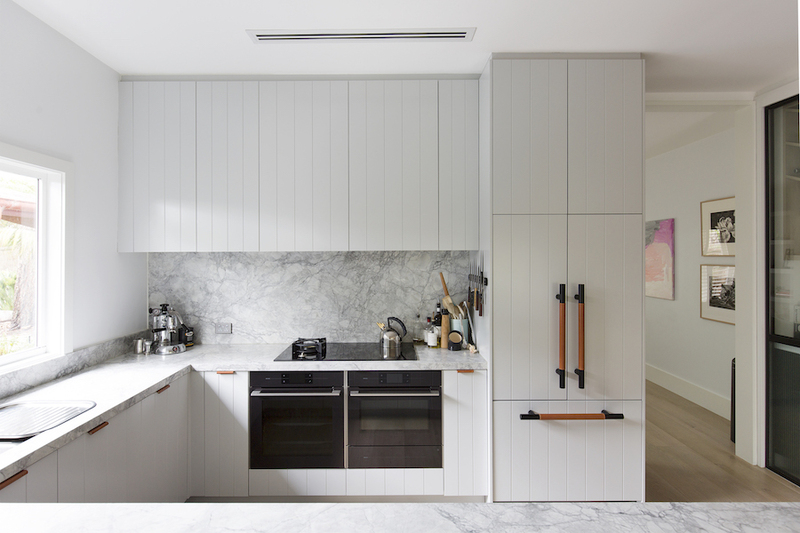 The fun – or stressful – part of designing a kitchen is deciding on your materials and colours. There’s more choice on the market than ever before and the more you research, the more options you’ll find! 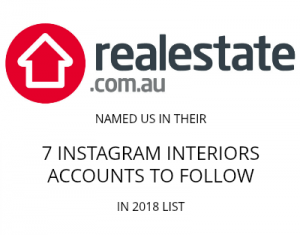 To avoid getting overwhelmed, we recommend doing your research (that means stalking design blogs, Pinterest, Instagram, going into kitchen display showrooms etc) and creating a mood board of images and finishes you love. As you build your mood board, you’ll begin to easily see what works well together and where perhaps you need to remove or refine certain selections. The trick to a great overall scheme is contrast – combining matte or gloss with textured materials, dark and light, angular with round. Try not to lock in selections purely because they are ‘on trend’, rather, make sure you’re selecting colours and materials because you love them which will ensure you still enjoy your kitchen long after the trends have passed. One of the most important decisions for your kitchen is selecting appliances. They account for a large portion of your budget and are the workhorse of your kitchen. The type of appliances you select and brand can also affect your house value for resale so here are some tips to choose wisely. Every kitchen needs at least one oven, a cooktop, rangehood, refrigerator and preferably a dishwasher. However, if you’re designing a kitchen for the luxury market, it’s common to have more than one of each appliances (such as two or more ovens) and also additional features such as a wok burner or steam oven. Consider if you’re designing the house primarily for you or if you plan to sell in the near future and take this into consideration when selecting appliances. If resale is on your mind, look at what other houses in your price range are offering in their kitchens so you can be competitive. Of course, it’s not just a simple decision of selecting one of each appliance – and it seems selecting a cooktop can be particularly challenging. First there’s the choice of ceramic, induction or gas cooktop. Ceramic cooktops are ultra sleek and work with any type of pot or pan, however gas cooktops often appeal more to buyers and the master chefs among us. Recently, induction cooktops (those that heat pots directly using electromagnetic energy) have become increasingly popular, however they do require special cookware. 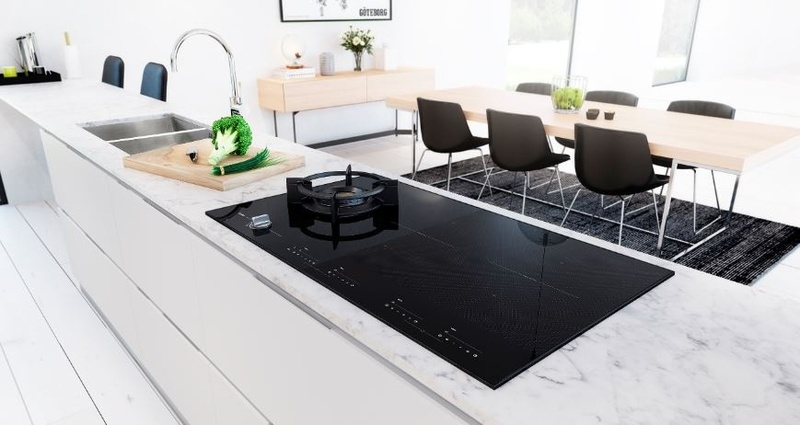 Of course, if you can’t decide between induction and gas, you can opt the HIG1995AD Duo Fusion cooktop from ASKO, which offers the best of both worlds with a Volcano gas burner and four bridge induction zones. Other decisions to make for your cooktop are colour – stainless steel, anthracite or black glass? – and size. The trend towards multiple ovens is here to stay so if your budget allows, consider having more than one in your kitchen design. A stack of ovens in a wall unit is more ergonomic and looks sleek. For example, you could stack two 60cm ovens on top of each other, or if you’re having four ovens, you could stack two 60cm ovens side by side and have two 45cm ovens below. 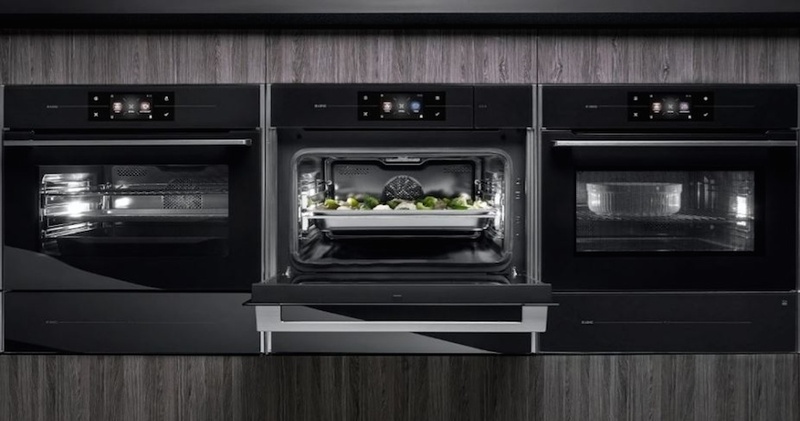 If you haven’t made the switch to a pyrolytic oven, be sure to look into these before selecting your ovens. What sets these ovens apart is that they heat up to extreme temperatures during pyrolysis (heat) cleaning, creating a super-clean oven with the power to perform all cooking tasks with ease. The main decision to make with your rangehood is whether you want it to be integrated below overhead cabinetry or be a design feature. Refer back to the mood board you created to help guide your decision. Alternatively, you might like to browse the range of stylish rangehoods by ASKO here. Dishwashers are seen as a necessity in kitchens these days, and many luxury kitchens have at least two. There’s no need to explain why – they save you time, offer a more hygienic way to clean, and allow you to quickly pack away dirty dishes at a dinner party and get back to entertaining. However, not all dishwashers are created equally and Gina made the mistake of selecting a dishwasher with a cutlery top shelf. This compresses the size of the bottom shelf and glass drawer, and means the bottom dish drawer is too small to fit dinner plates, let alone larger items like baking dishes! Although dishwashers may seem like a straightforward appliance decision, be sure to check the capacity of the lower basket and other features so you get the best dishwasher. The final appliance to tick off the list is a fridge or two! 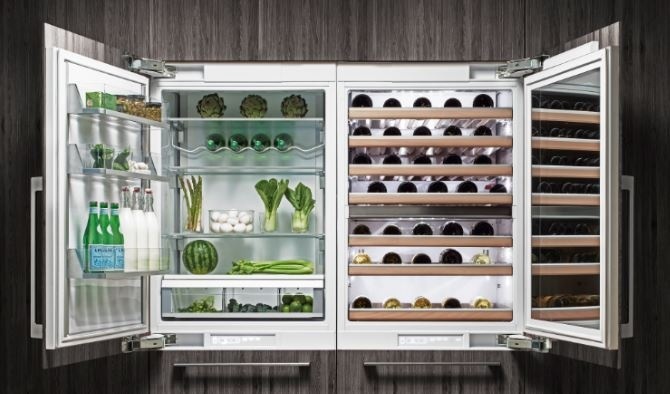 Fully integrated, large capacity fridges with flexible internal shelves and racks are what we suggest. A separate door for the freezer is also more functional and energy efficient. If you’re designing a large, luxury kitchen, having two fridges isn’t unheard of and of course, don’t forget the wine fridge! Another thing to keep in mind about appliances is design – do the appliances look sleek and complement your overall design? Do all the appliances work well together or are they different materials, finishes and shapes? Something we love about the ASKO range is their Scandinavian design – minimalist and timeless – and that they all coordinate perfectly with each other. You can find even more helpful information about how to choose the right kitchen appliances on the ASKO website here. One of the most valuable features you can incorporate into your kitchen design is storage. If you’re short on space you can maximise the space you have by opting for deep pull out drawers rather than cupboards – you’ll be able to store more and access items more easily. Also look for clever internal storage organisers or dividers. You’ll thank yourself for thinking of these small integrations ahead of time. Caesarstone, quartz, natural stone, timber, bamboo, concrete, stainless steel, laminate or composite material? There’s no shortage of options on the market and don’t even get us started on colour options! What’s important is to do your research ahead of time and understand the pros and cons of each benchtop material. For example, while concrete is a beautiful organic choice, it is porous and does require ongoing maintenance, and will scratch and stain with use. If you want something low maintenance but love the concrete look, opting for a concrete-look quartz or Caesarstone product may be a better option. Your splashback is an opportunity to be a bit bold with colour or texture. Unlike other tiled areas in the home, splashbacks don’t have to be waterproofed and this makes them easier to change or replace down the track with little expense. So if you want to add a fun splash of colour or play with texture, the splashback is a ‘safe’ place to do this. There are thousands of tiles you could choose from to bring your kitchen design to life, or even try something less common such as brick. See this round up of statement splashback ideas we recently shared. 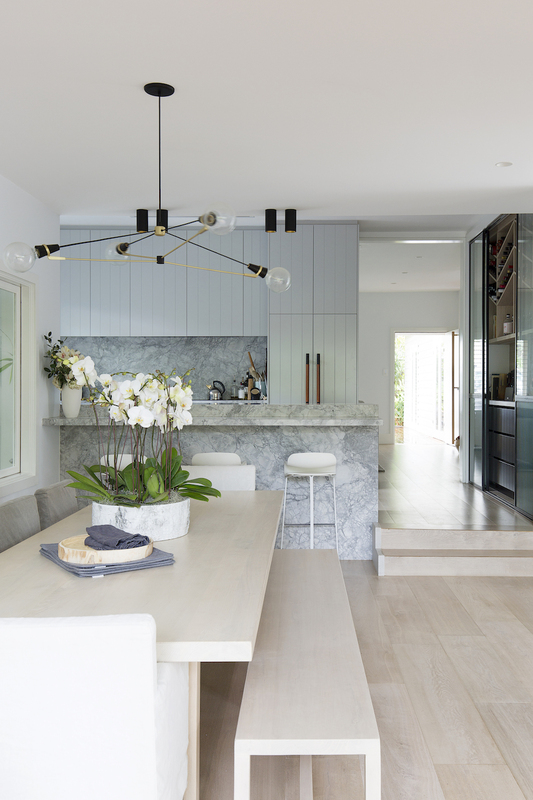 A well-designed lighting plan is essential for a successful kitchen and the three types of lighting to consider are task, ambient and accent. Task lighting helps you perform tasks, such as lighting above the island bench to make food prep easy. Ambient lighting is the overall illumination of an area, such as downlights to light up your kitchen. And accent lighting is that final layer of lighting that adds creativity or interest. You might like to read more about kitchen lighting options here. additional powerpoints or USB ports to charge phones. Before locking in your kitchen design and selections, sit with your choices for several days or weeks. Ask yourself if you’ve made any choices simply because you think you should or if you’re truly happy with what you’ve picked. During this time you may also spot new opportunities, such as being able to maximise more space or add a small but striking design feature. 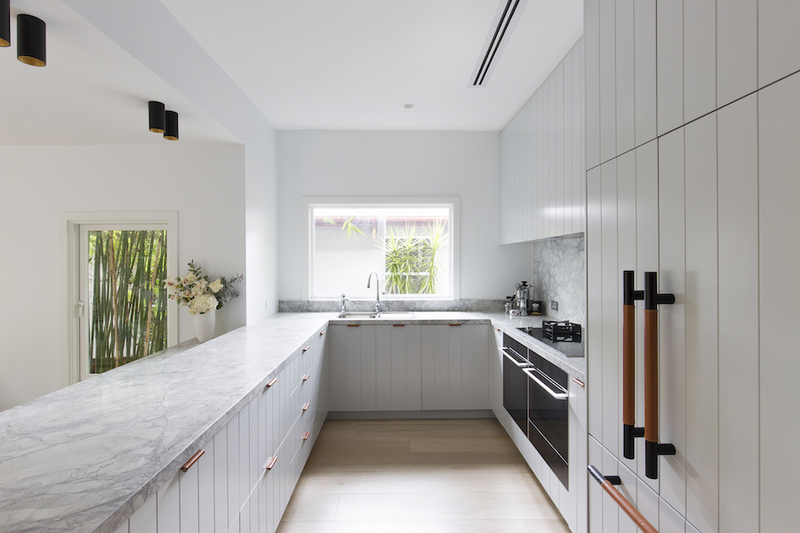 We hope these 10 tips for successful kitchen planning have helped you. If you have any questions, please pop them in the comments below and we’ll answer them right away! Next articlePlanning my living room makeover and a peek at the progress so far!